Something new when adding a chunk? Something new when adding a chunk TODAY? That's right, we're now making nice, super-easy-to-use, pre-made images for the most popular server uses and putting them just two clicks away when you go to make a chunk. All our images are "professionally" made so you know they'll have all the best options already pre-configured and ready to go for sit-back-and-enjoy enjoyment. 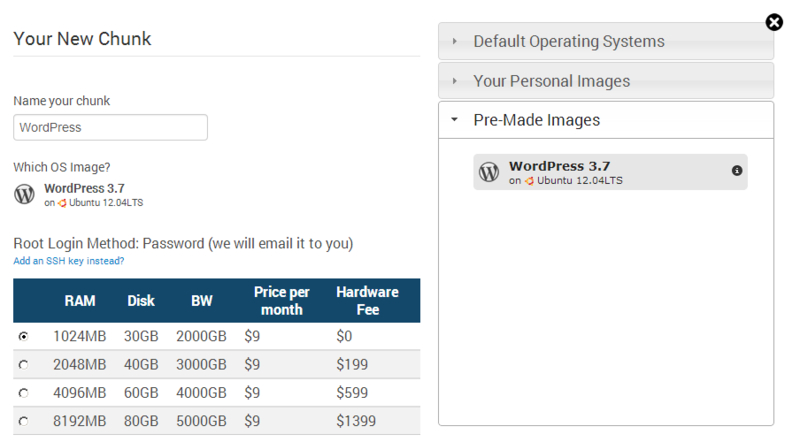 The first one is WordPress (the best open source blogging/CMS software out there). Next is Minecraft (ask your kid). Then... well, you tell us! Don't know what you're doing with your chunk? Don't worry chunky, everything is okay.